I recently read Why Our Schools Need the Arts by Jessica Hoffman Davis (2008), founder of the Arts in Education Program at the Harvard Graduate School of Education. Reading this book hot on the heels of Susan van Gelder’s post last week about Makerspaces, I was struck with its unique perspective on the Arts in education and its emphasis on the tangible art ‘making’ in all Arts domains: visual arts, drama, dance and music. Like most of what I write about, I have a personal relationship to the topic. As a child, I attended F.A.C.E school here in Montreal. The acronym stands for Fine Arts Core Education and in the 1980’s it offered (and as far as I know continues to offer) its students Arts subjects every day taught by specialists. Today, I am not a professional artist, nor did I exhibit any overwhelming talent for singing, playing the clarinet or visual arts (although I was a fairly good actor). And despite all this, I strongly believe that who I am and how I see and interact with the world is in large part due to my experience at F.A.C.E. Jessica Hoffman Davis’ jewel of a book (it’s short, an easy read at 150 pages) was for me packed with Aha! moments and unique ways of putting into words what I believe about giving arts education equal air time with academic subjects. While primarily a book intended for arts advocates, I related as a parent and educator to what she wrote about how we can interact with the art-making process and product of children of all ages (and discovered that I was of course saying exactly the opposite of what I should be saying to my own pre-school aged daughter!). But the heart of Davis’ book is her presentation of the unique features of the arts, those aspects of life that the arts bring into learning that other subjects do not. It is through these five unique features that Arts education is positioned to meet the particular needs of today’s world and the world of the future (for more on education for the future, read an earlier post on the Cross-Curricular Competencies). All the arts offer the child/learner the possibility of making something that can be experienced, that is, seen or heard at the very least. According to Davis, this tangible product (for example: sculpture, dance choreography, musical creation or performance, skit) allows children to think beyond the given, to explore the possibilities of “what if?”. What if I put on an accent, or lower my voice suggestively? What if I pinch this clay like so? In the moment, there are no wrong answers, only possibilities. The flip side of imagination and possibility is agency – the idea that we can be agents of effectiveness and change, that what we DO makes a difference to the outcome of a piece or a performance. What power! Imagine if we all felt fully capable and fully convinced that our actions were instrumental to our workplace, community, the world? Davis’ second point is that the Arts allow children/learners to express and recognize their feelings in a variety of modes. Making art can be about expressing one’s current feelings, or expressing a feeling: “This is how I feel, this is how this piece makes me feel.” But sharing one’s art and exploring the art of others also makes one aware of and attentive to the emotions of others, to appreciate “This is how you feel”. 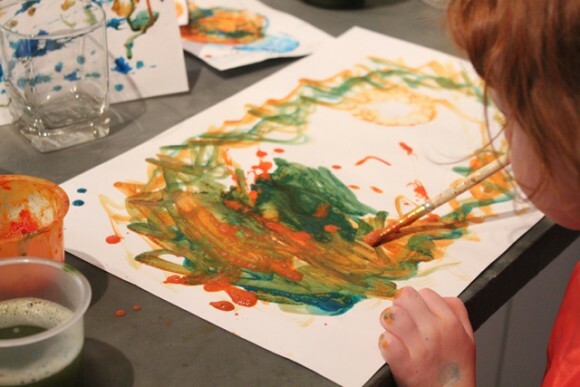 Children who regularly engage in art practice develop an awareness of the role of emotion, both in themselves and in others. How many of us have been on teams or worked with others and experienced first-hand the impact of emotions on the group’s ability to generate new ideas and move forward productively? What struck me was this third one – ambiguity. The Arts lay the foundation for understanding ambiguity as children engage in interpretation of their own works and in the works of others. As they interact with a work of art, they realize: “My contribution to this art relationship matters. What I think matters”. When they listen to what others see and think when they interact with a work, they realize that there is no single answer, no right answer. The artist can have one thing in mind, but can accept that what you see is valid as well and that it adds to the conversation. This ambiguity and lack of clear-cut right or wrong answers allow children/learners to realize that what others think matters, that there is between the artist and audience a conversation that is fluid and meant to be engaged in fully. In a world where we are constantly confronted by opinions and views that differ from our own, having the ability to navigate these differences and nuances with equanimity is a valuable skill for team members and leaders alike. Educators of all academic stripes have long championed process over product and learning from mistakes or wrong answers. Making something new is fraught with the potential of fruitful errors, of the oops! discussed in Makerspaces. When exploring the unknown (an unexplored medium, a new artist or work), inquiry takes on an added urgency as learners ask: what do I need to know in order to move forward? Because making art is tangible, students see immediately the impact of their inquiry (process) on the product and are reminded once again of their agency in directing that process. In addition, making art creates very real opportunities for reflection at each step of the process: How am I doing and what will I do next? These reflections are not just nice to have, but occur naturally as children/learners are confronted with an in-progress piece. Every addition, or repetition demands a step back and an assessment: How did that go? What do I think now? Drawing attention to this natural reflection process can certainly help learners gain self-awareness in all academic areas. Here in Quebec, as elsewhere, educators strive to increase student connection to school and to life through projects and extra-curricular activities. The Arts often provide the backdrop for these initiatives, with plays, concerts, art fairs and performances common in many schools. Indeed, “the arts in education excite and engage students, awakening attitudes to learning that include passion and joy, and the discovery that ‘I care'” (Davis p.76). Caring about something, about anything, is the pathway to engagement in all spheres. Discovering that they are united with human beings everywhere in their ability to make art and to make art for a variety of the same reasons allows children/learners to be open to others across cultures and times. We are fortunate that our Quebec Education Program outlines rigorous competencies for each of the four Arts – the challenge now is to make sure that the time allocation for arts is adequate to fully develop these competencies and take advantage of the five unique features that the Arts bring to education. Jessica Hoffman Davis has written other books about the Arts in education, including the follow-up to this book, Why Our High Schools Need the Arts (2011). Her voice is compelling and her use of narrative brings to life her ideas about art education for her readers. My copy is full of highlighted passages and exclamation marks and I am sure yours will be too! Why Our Schools Need the Arts by Jessica Hoffman Davis (2008) is available from Teachers College Press. Not long after reading your post, I came across this one from Edutopia http://www.edutopia.org/stw-arts-integration-tips on how to infuse the arts in school curriculum. I know that for me, the arts (in my case the band) was the highlight of my time in high school many years ago. Music has continued to enrich my life. In addition to all the pluses you have mentioned, the performing arts teach about teamwork, about discipline and focus. Even when playing the music written by others, there is the important aspect of interpretation – putting one’s own stamp and understanding on the performance. The arts are a vehicle to learn so many of the important competencies we need to succeed as adults and then they pay multiple dividends as they continue to nourish our inner lives. In the book, performance (dramatic, musical or dance) is considered to be in the realm of agency, since YOU are in control of the outcome. And of course working with others is so crucial to a dance ensemble number, a band or choral piece or dramatic scene. Thanks for your response to the post!